Top music developers have thrown in some great items. If you fancy getting your hands on some music software at a potentially great price - and doing a little good for once - you may be able to bag a bargain. 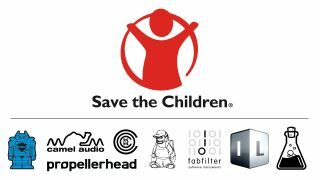 Currently up for grabs are FabFilter's Total bundle (worth over €1500); two bundles from Propellerhead, dishing out Reason 8 and licences for all their own rack extensions (worth over €1000); and Audio Damage's Everything bundle with… everything by them (worth €1000)! There's plenty more from loads of other companies on the list as well, and several items are still to see any bids. If you haven't already, register at the KVR forum and check out theforum thread. The first page lists the software up for grabs and the current high bids on each item. Reply to the thread with your bid in whole dollars for the package you're after, and keep an eye on the competition. We'll keep you informed of any new additions and give you a final reminder as the auction gets into its closing stages.